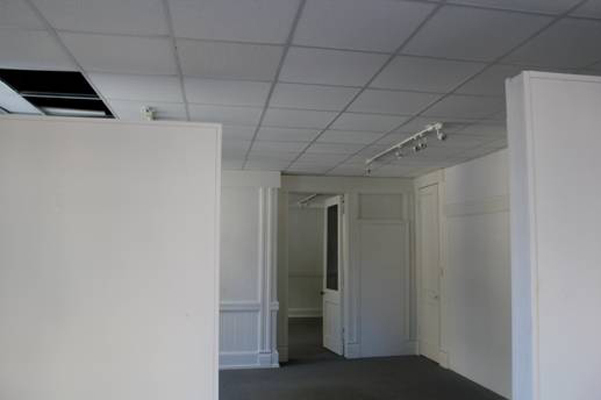 this dramatic interior renovation for a commercial space is located at 132 east bay street in charleston sc. the owners of reclaimed designworks approached us to transform the existing artist studio and gallery space into a show room for their unique business of reclaiming old barn wood and re-using it in new construction and renovations. as with many historic buildings in charleston, we began with a space that had many hidden opportunities which had not been recently explored. the first step was to conduct a thorough study of the space and determine the existing structure. in this instance, dropped ceilings were installed sometime in the 80’s to help with reducing high energy costs with heating and cooling the space while minimizing the natural daylighting for the previous art gallery. the interior door and window frames had been sealed and the exterior windows had been boarded with plywood above the ceiling line. we discovered a wealth of opportunity in the ceiling cavity and began removing everything that wasn’t structural. our goal was to open the space as much as possible while creating a clean canvas on which to display and enhance the reclaimed wood. 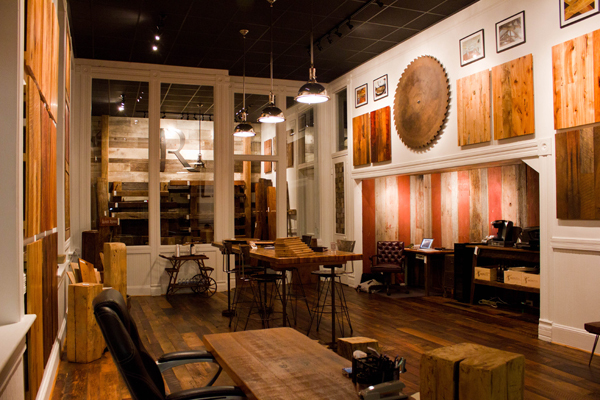 reclaimed wood flooring was installed throughout. new glass was installed with the revealed interior windows and doors. a dropped ceiling is now approximately 6 feet higher than the previous ceiling. the space barely leaves a hint of its previous use and has provided a very successful selling point for the owners at reclaimed designworks. at cumulus architecture + design, we strive to make the most of every space we encounter. if ever in need of commercial or interior renovations, we can offer a range of services whether you are design driven or budget conscious. we are also available for any consultation needs. please contact info@cumulusarchitecture.com for more information.